As well as the moon, I targeted Jupiter last night. Jupiter is currently in a very favourable position – nice and high in the sky, and closer to Earth than its been for a long while. This makes it ripe for imaging. 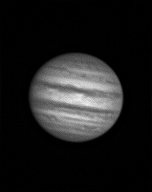 As I wanted to test out my QHY5v as an imaging (rather than just guide) camera, I decided to make Jupiter one of my goals for last night.